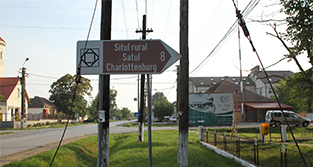 Charlottenburg is the only circular village on Romanian territory. It was listed as a protected monument by the Ministry for Culture and Cultural Assets in Bucharest. However, it is not easy to recognise the village as a Rundling. Only when viewed from above, the round design of Charlottenburg becomes obvious. The beautiful plans for the village from the baroque era have been preserved. Charlottenburg, also called “Șarlota”, “Baricza“, “Bariţa”, “Charlotenburg“, “Saroltavár” or – in the Banatswabian dialect – “Schalotteporch”, was settled by 32 colonist families from Trentin in South Typrol, from Lorraine and Baden-Württemberg in 1771. A first wave of settlement had been stopped by the plague in the early 18th century. The settlement’s name derives from the daughter or wife (Charlotte/Charlote) of Count Carl of Clary-Aldringen, Imperial Governor of Banat. During the time of Romanian national communism, the name was adapted to Romanian as “Şarlota”. After the fall of the Iron Curtain, the name was changed to Charlottenburg again and can be found on new maps as such – although no German settlers remain. Until 1880, Charlottenburg had been a purely German village. Only then, the first 32 Romanians and 32 Hungarians came to the village settled by 234 Germans. The following 50 years did not see major changes regarding the population. From 1930 onwards, however, the number of Germans decreased and more and more Romanians and some Hungarians lived in the village. In 2002, a single German was still living in Charlottenburg. The original circular construction had a well “with good drinking water” at its centre, surrounded by a grove of mulberry trees. This points to the time of secularisation under Joseph II: the well replaced the traditional Roman Catholic church at the centre of Habsburg settlements. Later, however, a church was built at the same place. 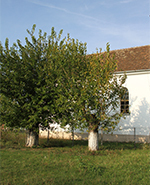 Some of the mulberry trees on the village’s central square could possibly stem from the time of settlement. The night of the 15th of January 1945 was decisive for the small German community: 22 Germans considered fit for work were deported to the Soviet Union. Until Christmas 1949, only 16 of them had come back. Only in 1964, every house of Charlottenburg was equipped with “the lamp of Ilitsch”, as electricity was called back then. In 1980, the school stopped instruction in German as the first language. For some years now, the village has been interesting for the tourism sector, since the deciduous woodlands around it allow for hunting and the forest has been declared Romanias first hunting and wild game garden. 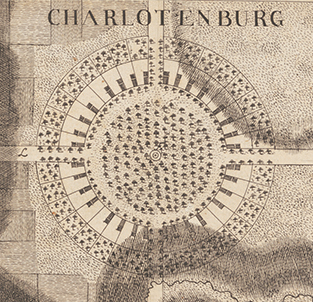 Plan of the circular village Charlottenburg from the baroque era. 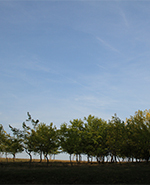 LEFT: Mulberry tree groves were planted during the last period of the Ceauşescu era, to allow feeding of silkworms close to the village. The road junction leading to the landmarked Charlottenburg from Maşloc.